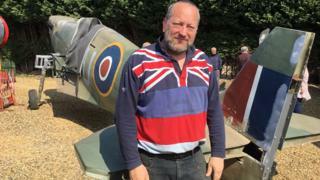 An aviation fan has said goodbye to a replica Spitfire fighter plane he spent seven years restoring in his garden. The aircraft in Paul Linsell's front garden in Heacham, Norfolk, became a local attraction, drawing interest from holiday-makers. But it has finally been moved to an aviation museum where its restoration will be completed. Museum chairman Jim Paradine said his "jaw dropped" when he saw the replica fighter plane for the first time. "I didn't expect much" said Mr Paradine when he decided to go to Mr Linsell's house to take a look at the replica. "But sitting on the lawn was a mark nine Spitfire. It was absolutely incredible, I couldn't believe it." Mr Linsell, 55, said the replica was originally made "many years ago" for display at Duxford Imperial War Museum in Cambridgeshire, but was written off after being damaged in storms. He bought the plane from a friend for about £6,000 and has spent the years since completing essential repairs. "I say to people it was either that or a very large garden gnome, so I went for the Spitfire," said Mr Linsell. "I bought it for the love of it - I've always loved Spitfires. I'm not a RAF man but I've always had an interest in them." The plane has been loaned for four years to the Fenland and West Norfolk Aviation Museum, where it will be resprayed, the cockpit refitted and where "more people can appreciate it" said Mr Linsell. Mr Paradine said it would now "take pride of place" and he expected the Spitfire would be a big draw. The museum is raising funds to buy its premises and secure its future, and will display the single-seat fighter alongside the fuselage of a Hurricane aircraft, another renowned World War Two fighter plane.